First, I want to apologize for taking so long to get Week Fourteen out. SO much has happened that I completely forgot to blog!! So, what really happened that kept me so busy in week fourteen?? I got a job!! Not just the job as a stay at home wife, but a real teaching job. I had received a text from an old professor at Whitewater asking if I had a job yet. I of course replied No and she said well we’ve had some frantic calls the last few days from schools who still don’t have teachers. The next morning I had three positions, all long term subbing, waiting for me in my mailbox when I awoke. Two of the positions really interested me as they were through Muskego School District. The Muskego District is the one district that I’ve always wanted to be apart of, that was until I worked in KUSD and met all my fabulous friends!! Well I filled out the applications and the next morning received a call for an interview. That was Wednesday, Thursday morning I had the interview and a tour of the school. An hour after my interview was over the Associate Principal called to offer me one of the positions. Of course I accepted, but had no clue what I’d be teaching as the other position hadn’t been filled yet. In the interview I did let them know what classes I would and wouldn’t feel comfortable teaching. Plus, I was secretly hoping for the position that wasn’t four weeks long. On Friday, I received a call from the teacher I’d be subbing for and definitely was a little disappointed as it was the shorter position with the classes I didn’t feel as comfortable teaching. In the afternoon I received a call from the Associate Principal to come in and get some keys. When I got there, she was talking with the other girl whom she had hired. Come to find out, I now was going to be in the longer position. By the time this all happened it was 4pm on Friday. I had a chance to go to the classroom, but no idea where anything was or way to login to a computer. I kind of sat around for a little bit and then left. There was nothing more I could do. School started on Tuesday, so the best I could do was come up with some activity to “get to know” the kids. Needless to say, I am extremely excited about having a new job in a new place and finally teaching high school. Starting off the school year and having no idea what the heck I’m supposed to be doing will be quite interesting. Not to mention the fact that I’m teaching Medical Terminology, which I know nothing about and Accounting which I haven’t taught since student teaching!! This ride will definitely be interesting and I am sure there will be lots of stories to share!! For Labor Day weekend, I spent some time with my parents and they took me to the Walworth County Fair. It was just like I was a kid again, except we skipped the whole “ride” section. I also spent to some time with my inlaws, while Ben was gone. We all had a nice time together and the boys started coming with the names for the baby. I can assure you, that even though Kieran really wants the baby to be called Poofy Head, that name is out of the running!! A good friend of mine good married over the weekend as well. It was a beautiful ceremony and reception. I rode solo, as Ben was gone, but it was really great to catch up with people that I hadn’t seen in awhile and spend time with others as well. As you can see, Ben joined in on the picture fun this week. 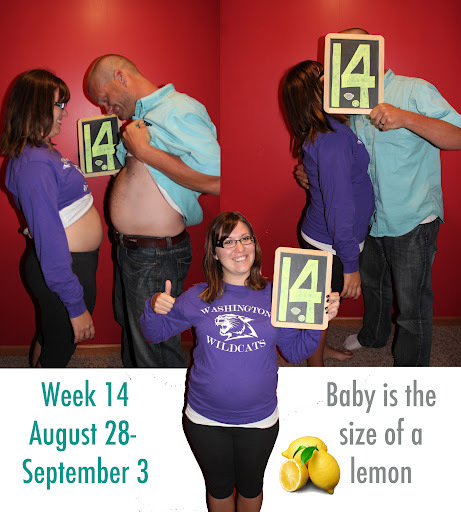 I like to call this one “Allie at 14 Weeks Pregnant and Ben at 14 Weeks while his wife has been pregnant! !” Thanks for being such a good sport!! Maternity Clothes: We’ll see how the week of school goes trying to fit into clothes that I haven’t worn in months. Probably going to end up buying some that actually fit. Best Moment of the Week: Getting a job. Even though it’s a long term sub position and I don’t know how long I’ll be there, I’m extremely excited. Being a stay at home wife, was starting to get quite boring. There was only so much cleaning one could do!! Movement: None, which is dumb. I told Ben this week that I wished having a baby only took 6 months because than I’d be almost done. I’m just so darn excited that I don’t know how much longer I can wait!! Food Cravings: Corndog and Fresh Squeezed Lemonade, which was exactly what I had at the fair!! Anything Making Your Queasy or Sick: No, but I did have a little stint of the flu this week or maybe it was a day of morning sickness. Gender: Thought it was a boy up until this point, now I’m getting a little bit of a girl vibe.